Developments in the Food Industry: Science, Technology, and the Environment (Enhanced DVD) explores the age-old quest to bring more as well as better quality foods to the world. Whether it has been with better irrigation methods or genetic modification, viewers of this film will understand the methodologies that have been developed since the dawn of history to create a better-fed world for tomorrow. 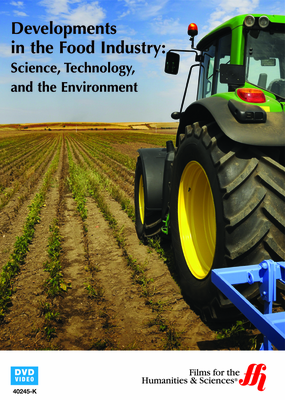 Developments in the Food Industry: Science, Technology, and the Environment (Enhanced DVD) takes viewers through the age-old quest to develop more and better qualities of foods to the world. Beginning with the dawn of civilization and working towards today's efforts to create super foods with genetic modification of both plants and animals, viewers will get a complete look at the entire spectrum of the food development industry, from growth to packaging design.